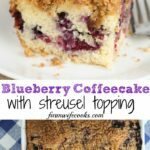 This Blueberry Coffeecake with Streusel Topping is an old Amish recipe that makes the perfect breakfast or dessert! 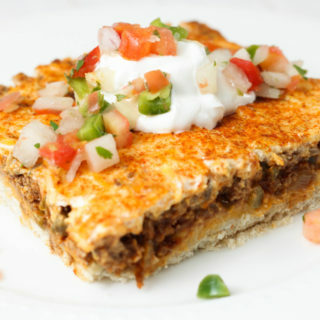 This recipe was adapted from a recipe in the Cooking from Quilt Country Cookbook which is filled with Amish and Mennonite recipes. 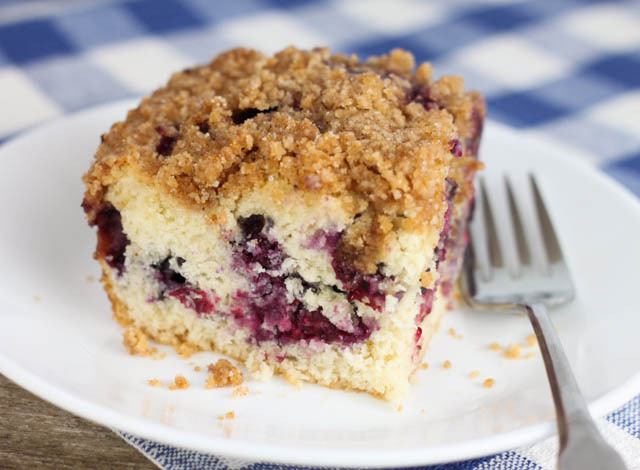 Looking for other coffeecake recipes? 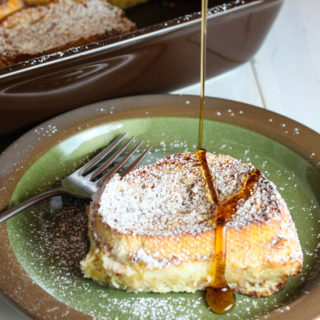 Check out my other coffeecake recipes, Crock Pot Coffee Cake, Caramel Apple Coffee Cake, Butterscotch Coffee Cake and Banana Cream Coffee Cake. 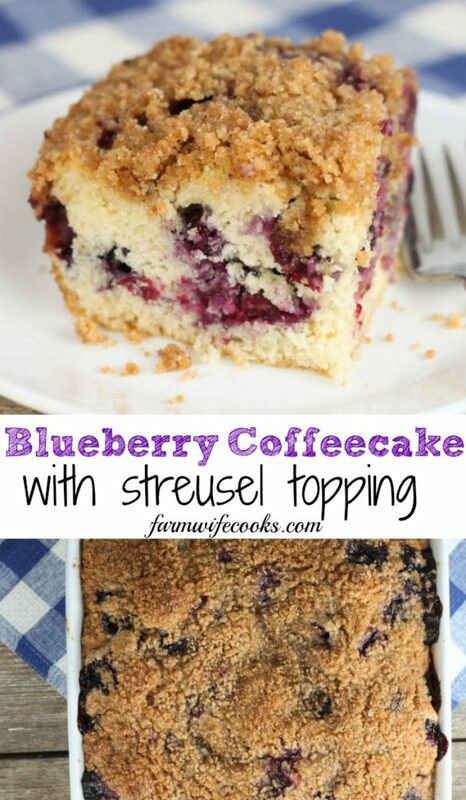 Blueberry Coffeecake with Streusel Topping is the perfect breakfast or dessert to serve at a brunch or potluck and would be great as an afternoon pick me up served with coffee. 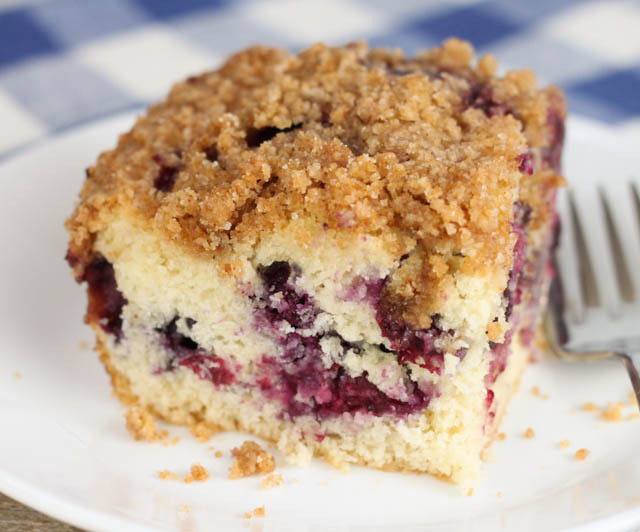 This coffeecake recipe makes the perfect amount (uses an 8 inch square pan) but could easily be doubled for a larger crowd (if recipe is doubled use a 9×13 inch pan). 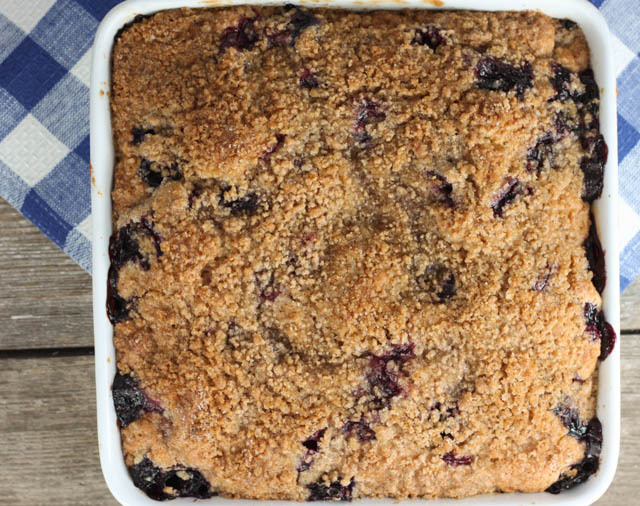 The batter will be very thick so it is best to gently fold the blueberries in or layer the batter and blueberries and then more batter. In a medium bowl, mix the dry streusel ingredients and then cut in the cold butter (this can also be done in a food processor) and set aside. In a large mixer bowl, cream the butter and sugar. 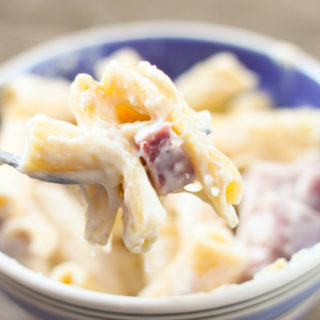 Add the dry ingredients to the butter mixture alternating with the milk with the mixer on low speed. Fold the blueberries in by hand with a spoon, the batter will be very thick. Spread the batter evenly in a 8 inch square pan sprayed with cooking spray. Spread the streusel over the cake batter. Bake for 40 mins or until a toothpick comes out clean from the center of the cake. Let cake cool for 15 minutes, then cut into squares and serve warm. I’m sitting here with my coffee wishing I had a piece of this cake! I love blueberry desserts and this looks scrumptious.